A well made spring roll is as perfect a snack as has ever been created. 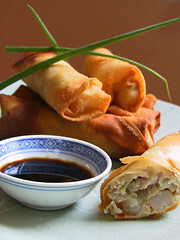 What gives a Chinese spring roll its distinctive flavour? The combination of soy sauce and sesame oil is part of it. Add in spring onion and the seemingly unusual combo of pork and prawn and we’re starting to get there. A little finely chopped ginger is a personal touch. It goes well with the pork, prawn and spring onion combo. While not entirely traditional it would be unusual for me to ever leave it out. Five spice powder is an optional extra but does add that intriguing taste of the Orient. You can find Pampas spring roll wrappers in the frozen foods section of the supermarket. Mince the pork fillet or chop into small pieces and pulse once or twice in a food processor. Chop the prawns coarsely. Mix together the pork mince, prawns, ginger, spring onions, soy sauce, sesame oil, salt, pepper and cornflour. Mix well until the cornflour is no longer visible. Pour in about two-thirds of the beaten egg. Keep the rest for sealing the rolls. Lay a wrapper on a flat surface. Take a tablespoon of mixture and lay it in a slim sausage shape diagonally across one corner of the wrapper. Fold the corner over, roll a little way, fold in each end and continue to roll up. Secure the end with a little egg. Deep fry the rolls in hot oil for about three minutes or until they are golden brown. Lower the temperature of the oil if they are browning too quickly.